Move over apples. A papaya a day may be the best way to keep the doctor away. It’s time to turn your attention to another fruit: the papaya. Hailed as “the fruit of the angels” for its delicious taste, papayas could have earned this nickname with the effect they have on the body. Papayas and papaya juice pack tons of potential health benefits. Papaya’s healthy rep dates back all the way to ancient times. Papaya has been used to treat everything from irregular periods to sunburn and irregularity. Read on to find out what this super fruit can do for your health and how you can take advantage of all of the benefits of papayas and papaya juice. The papaya is a tropical fruit native to Central America, Mexico, and small parts of South America. Once very rare, growers have cultivated the fruit to grow in other tropical areas outside of its native habit. Farmers now grow papayas in Hawaii and parts of Asia as well. Because of its abundance, papayas are no longer the rare, exotic fruit they once were. These delicious fruits can now be found fresh in most grocery stores year round. There is a slight peek in papaya season early summer through early fall. Papayas grow on tiny but bushy trees with large leaves. The smooth skinned papaya fruit is round or pear shaped and can be up to 20 inches long. Papaya melons are usually harvested when they are green and ripened after they are picked. Once ripe, papaya flesh is sweet and slightly musky. The black edible seeds inside of a papaya have a peppery flavor that contrasts the sweetness of the melon. Look for skin that is half green and half golden. The exterior should have some give, like a ripe peach or nectarine. Don’t worry if you can’t find a ripe papaya. Green papayas generally ripen within 2 to 3 days. Only use papayas that are still somewhat firm to juice. If the papaya is over ripe, it will be pulpy and hard to juice. Don’t eat your papayas or use them to make juice until they are ripe. Unripe papayas will be bitter unless cooked. Roasting a green papaya will cut the bitterness and make them more savory. Drinking papaya juice is a tasty and easy way to give yourself all the benefits of papaya in a glass. Not only can you substitute a glass of papaya juice for your morning cup of orange juice, but you can blend up your own delicious juice and smoothie combinations. By making your own papaya juice or smoothie combos, you can pair papayas with other superfoods and drink a cup full of healthy goodness. To come up with your juice combinations, either figure out what your health goals are and choose your ingredients accordingly or just blend together fruits and veggies with papaya to suit your own likes. Try combinations like papaya, pineapple, and mango or papaya with carrots and kale. Check out this refreshing papaya and pineapple drink from Martha Stewart here. Making papaya juice isn’t hard with a little know how and the right equipment like a juicer or a good blender. Follow these tips to make your first healthy and delicious papaya drink in a blender. Pick a good papaya. Your papaya needs to have the right amount of ripeness. If it is too ripe, the juice will be very pulpy, which can be unappealing. Set aside seeds. You can choose to add the seeds in if you wish. Be aware though, the papaya seeds may leave the drink with a bit of bitterness. Put the papaya into a blender along with mix ins. Feel free to experiment with your ingredients to suit your tastes. Try pineapple and mango for a tropical blend. Berries and kale also make great additions and up the health value of your juice even more. Add liquid! It’s very important to add some liquid to your mix. Add at least 1 cup of liquid. Try water or coconut water for added electrolytes. You can also make papaya juice using a juicer. Try it by following these steps. Pick a good combination of fruit or veggies to add to the juicer with papayas. Try cucumber and green apple for a tart, refreshing papaya juice. Run the papaya through your juicer according to its instructions. Add any other fruit and veggies you desire. Drink immediately to enjoy or refrigerate for up to 12 hours. Papayas can keep your ticker in tip top shape. Chock full of vitamins A and C, these vitamins prevent nasty orchestral from building up in the arteries. In fact, studies have proven that getting enough vitamin C may be just as beneficial for your heart as exercise. Research has found that taking 500 mg of vitamin C per day gives your cardiovascular system the same good for you effects as taking a 30 minute walk.The USDA’s nutrition information shows eating a small papaya gives you nearly 100 mg of vitamin C at one time.Not only do papayas pack a vitamin filled punch, but they are very high in fiber. Eating a high fiber diet may help lower levels of bad cholesterol.According to the Mayo Clinic, soluble fiber reduces the blood’s ability to absorb the bad LDL cholesterol. Keeping the level of LDL cholesterol low keeps the blood flowing freely through your arteries and helps prevent heart attacks and strokes. The same vitamins that make papayas so good for your heart are powerful antioxidants, which help protect the body’s cells against damage. Studies suggest that papaya’s combination of powerful vitamins, minerals, and antioxidants slow down damage to vital organs. When rats were fed water with papaya extract mixed into it, the rats had significantly less damage to their kidneys, livers, and stomachs. It’s reasonable to believe that humans could reap the same benefits from eating papayas or drinking papaya juice. Rich in lycopene, papayas may help prevent certain cancers. Medical professionals agree eating foods rich in lycopene, like the papaya, daily reduces the risk for prostate cancer. Adding this powerful cancer fighter to our food and drink may ward off other cancers as well. According to Medical News Today, papayas may help regulate blood sugar levels. Studies indicate that patients with type 1 diabetes may have better blood sugar levels if they consume a high fiber diet. In type 2 diabetics, patients could see better blood sugars, lipids, and insulin levels with a high fiber diet. With over 5 grams of fiber, a medium papaya added into a daily diet could help diabetics take advantages of these benefits.Those that don’t have diabetes but are at increased risk of developing diabetes may prevent it by eating papayas. This high fiber, vitamin rich food has a powerful effect on the body’s ability to keep blood sugar and insulin levels in check. With such an abundance of vitamin C, it’s not surprising that eating papayas regularly can keep you healthy come cold and flu season. Studies show that vitamin C plays a vital role in keeping the sniffles at bay. Getting enough vitamin C shortens the duration of colds and makes you less at risk for viruses and infections than those who don’t get their full daily dose of vitamin C.
The vitamin C rich papaya also helps any wounds heal faster. When applied to the skin, mashed papaya promotes healing and prevents infection. Research shows that papaya may actually promote healing better than hydrogen peroxide. Papaya’s protease enzymes make it a powerful first aid tool. According to WebMD, papain, one of these enzymes, is commonly used to treat surgical wounds. With its high fiber content, it’s no surprise that papayas can help you loose weight. In fact, there is buzz about a 10 Day Papaya Diet to help flatten the belly. While it’s probably best to avoid any fad diets like the 10 Day Papaya Diet, there is some merit in the theories behind it.The high fiber content in a papaya helps you feel full despite its low calorie content. Plus with the abundance of antioxidants and vitamins, adding papayas to a healthy, low calorie diet may help your body release the stored toxins that hold onto unwanted belly bloat. Any food with so much fiber and such a high water content is bound to boost digestion and prevent painful constipation. 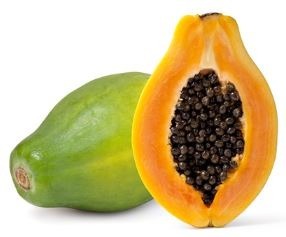 Aside from a high fiber and water content, papayas have a secret digestive ingredient: papain. The same enzyme that makes papayas powerful healers helps break down food in the digestive tract. The flesh of a papaya is a rich orange color, just like carrots. Like carrots, another eye booster, papayas pack tons of beta carotene and vitamin A. In fact, papayas may actually have more carotenoids than carrots. Research shows that diets rich in carotenoids can prevent eye disease. Slows the Signs of Aging. Drinking papaya juice just may be like drinking from the Fountain of Youth. With so much vitamin E and other beneficial minerals, papayas boost collagen production. Collagen keeps the skin looking youthful and wrinkle free. Increased collagen production can also increase hair growth, giving you longer, lush locks. You could even used mashed papaya as a face and hair mask for glowing skin and soft, conditioned hair. Choline is the key ingredient in papayas that helps reduce inflammation. Arthritis makes joints painful and sore with inflammation and swelling. Choline helps relieve this inflammation and ease an arthritis pain. If drinking papaya juice isn’t something you want to do daily, there are plenty of reasons to eat papaya every day. Work it into your daily diet with these suggestions. Chop it up and add it to a salad. Combine it with mango, lime juice, and a hot pepper for a tropical salsa. Use the seeds as a garnish for salads and soups. Roast papayas with cinnamon and spices. Is there anyone that should not eat papayas or drink papaya juice? Pregnant women should exercise caution when consuming papayas. There is some evidence that eating large quantities of papaya over the span of several days may be unsafe for the developing baby. Breastfeeding women should also consult their doctor prior to eating a lot of papaya. Those with latex allergies should be cautious when eating papaya. According to the American Latex Allergy Association, people with latex allergies may have an allergic reaction to papaya.